See more pictures from Oso Flaco Lake, California. Cross the lake and enjoy the scenery and wildlife. Continue walking all the way to the ocean among sand dunes and beautiful flowers. Once you find the right road to Oso Flaco Lake, this road ends at the entrance to the Oso Flaco Lake park. Park your car and deposit $5 for parking in an envelope provided at the park entrance. Once you have parked, start walking on the path right past the park gate. After about 5 minutes walking you will get to the walkway that was built on the lake. We loved sitting on the benches provided in the middle of the walkway. Our children enjoyed very much looking at all the different birds that abound at Oso Flaco Lake. Other than the noise made by the birds, Oso Flaco Lake is very quiet! Just sit down and relax and look around! It’s a beautiful and unexpected place in the middle of sand dunes. The path over the Oso Flaco Lake itself continues through the sand dunes on a wooden path. The path weaves its way through bushes and flowers and leads you all the way to the ocean. It takes about 20 minutes to walk but it is a beautiful walk and the view at the end of the path is stunning. Because you have to pay to be able to walk to the ocean, there are very few people in this area of the beach, once you get to the ocean. The path goes through sand dunes before it gets to the ocean and the view is spectacular. 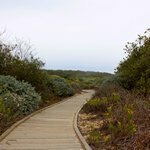 Oso Flaco Lake, California – Wooden path leads to the ocean beach through sand dunes. Oso Flaco Lake is very easy to miss even when you’re looking for it. Oso Flaco Lake is hidden in the Pismo Dunes Natural Preserve and it is surrounded by farm land. Situated about 30 minutes south of Pismo Beach and about 10 minutes north of the small town of Guadelupe, Oso Flaco Lake is hard to find. There is only one small street sign on Cabrillo Highway. If you don’t know what you’re looking for, you will definitely miss it. Once you get to the sign there is another five to ten minutes drive through farm lands until you get to the Oso Flaco park. Map of Oso Flaco Lake and surrounding area. What a beautiful place! Oso Flaco Lake is nestled among sand dunes and the state has built a beautiful walkway that goes almost over the entire lake. Then you can continue walking all the way to the ocean among sand dunes and beautiful flowers. You get an amazing view at the end of the walkway. It’s just an unexpected and beautiful place!